Fwiw, I also use Torque and have been following the battery aging thread for years, but I find Torque more difficult to set up, and all I really care about is knowing the battery SOC. If soul spy has the same data as Torque for those values, I'll probably just use soul spy. Yes, I completely agree. Torque is a hassle. What you actually want is the SOH - State of Health. Your car started with 27kWh usable and a 3kWh buffer and 0.5kWh that is always reserved. 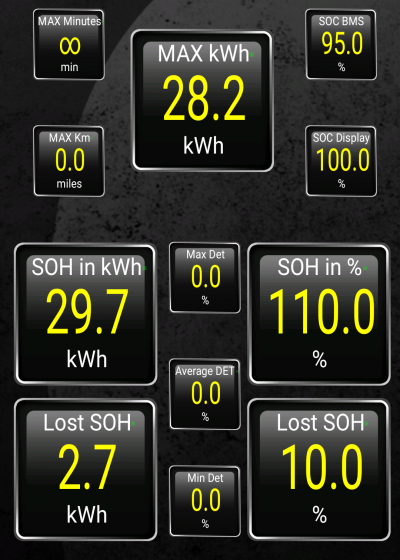 You now have 27kWh usable and 0,75kWh buffer and the 0.5kWh that is always reserved. At this rate it will probably be 15 years before you have to worry about the battery. If SoulSpy could just show this single data point in a simple way then I would recommend it above Torque, even though it is still alpha software. I think this screen is highly confusing, but because of the limitations of Torque it's about the best that software can do. SoulSpy could do so much better. Note SOH is derived from Min and Max deterioration. You cannot guess SOH by looking at the two measurements for SOC. Thanks very much for the detailed explanation (and for everything else you've done to help all of us understand our Soul EVs better - I've really appreciated your contributions and leadership for these past few years!). I don't have the SOH numbers on my Torque, so it looks like I need to update my data files. I'll do that. JejuSoul wrote: Note SOH is derived from Min and Max deterioration. You cannot guess SOH by looking at the two measurements for SOC. Hi, can someone please explain the definition of min deterioration and max deterioration for me? Min is short for minimum. It is used to mean the the least or lowest amount. Max is short for maximum. It is used to mean the the most or largest amount. Deterioration is a measure of how much the battery has degraded from its initial total capacity. There are 96 cell pairs. We get to see the voltages for all of them. But they only show us the degradation on 2 of the cells. The one with the most and the one with least. Hence Min and Max deterioration are percentages of capacity lost for the best and worst cell pair. Thanks. I thought it was just that, but wasn't sure. Hmm, I downloaded Soul Spy from the lates link I could find here, but it doesn't want to connect to my OBDII dongle. Torque Pro has no problem. Any ideas? ekhaat wrote: Hmm, I downloaded Soul Spy from the lates link I could find here, but it doesn't want to connect to my OBDII dongle. Torque Pro has no problem. Any ideas? The Soul EV Spy has never been tested with any other dongle than the Konnwei KW902 (to my knowledge). Is that the dongle you are using? If you want, you can email me the soulspy.log file from the SD card Downloads folder, so I can take a look at where it fails. soulspy crash when my odb is connected. The log files are in the Downloads folder on the SD-card - if the app got as far as writing them.